Been diving in Shark Reef Marine Reserve? Please Vote! The Shark Reef Marine Reserve was created by Beqa Adventure Divers (BAD) and is where their shark dive is held. Where during shark feeding times in the high season about 80 Bull Sharks will turn up on this site. On days where the seas are too rough to go out to the outer reefs I used to dive here when they were not feeding. This is definitely one of the most exciting dives in the area. You know sharks can be around but you have no idea if and when they will show up. We jump off the boat full of anticipation into the crystal clear water and descend onto a spectrum of colour emitted from the corals. The fish life is abundant. A big school of parrot fish swims by and snappers are everywhere. We start the dive by going down to 30 meters to see if the bulls are around. Yes! Three Bull Sharks are prowling the area. We settle on the ground gently and observe them swimming by, not fussed by us at all. They are big females, almost four meters long. We slowly ascend limiting our time at the bottom to be able to continue our dive. I carefully inspect a crack and find (I can’t believe it!) a baby nurse shark sleeping. A little further along we see a Whitetip Reef Shark peacefully swimming along and another one close by. 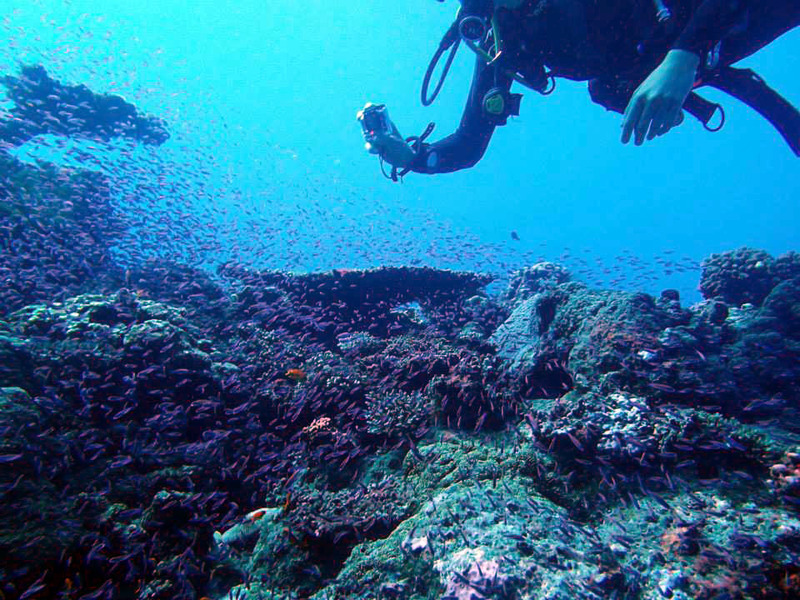 We slowly ascent and make our safety stop over the colourful reef spotting the dark outline of a Bull Shark down below. We carefully exit the water and can finally scream out in excitement. Map of Beqa Lagoon, Shark Reef Marine Reserve dive site.